It’s already hard enough for Russian American Anya to fit in at her preppy private school with a last name no one can pronounce (“Borzakovskaya”), a clueless mom and a booty that makes her regulation plaid skit a bit too snug. But after she takes a tumble down an abandoned well and discovers the skeleton of a long dead girl, life gets even more complicated. When Anya is finally rescued, she finds that she has brought home a little souvenir of her accident—Emily, the skeleton’s lonely ghost. At first Anya is annoyed with having to explain the modern world to Emily, who died ninety years ago. But soon she sees how having an invisible friend helps when it comes to cheating on tests or sneaking a smoke on school grounds. However, Emily begins wanting more and more of Anya’s attention, and Anya realizes that if she actually wants to make some living, breathing friends, Emily’s got to go. 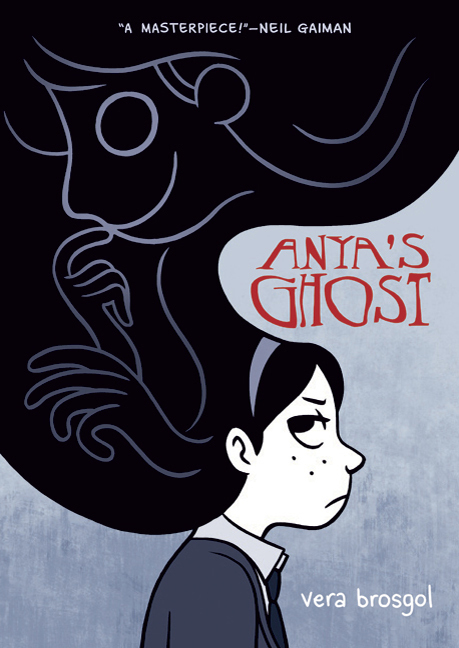 Except Emily has other plans… This gray-scale graphic novel is the kind of creepy treat I revere—a genuinely scary ghost story with a minimum of gore, a few well-placed frights and a bit of humor that turns gasps into giggles. Debut author and illustrator Vera Brosgol’s crisply drawn details convey Anya’s mood and characterization perfectly—down to the Belle and Sebastian and Weezer posters in moody, sarcastic Anya’s room. Besides being a classic ghost yarn and a realistic portrayal of the horror of high school, this is also a terrific story of being true to yourself and your culture while learning how to fit in on your own terms. After whetting your goulish appetite with Anya, try Hope Larson’s Mercury for more good ghostly, teen angst fun. Wonderful book! It is rare that it spends any time on the shelves at all in the school library where I work. When I read this, I was expecting this to be a nice, easy read, and it was. But it was also surprisingly layered. The sidestory with the perfect girlfriend, Anya’s friend Siobhan, the other nerdy Russian kid – they were all interesting and added to rather than distracted from the plot. Hello! I just would like to give a huge thumbs up for the great information you have here on this post. I will likely be coming back to your blog for much more soon.